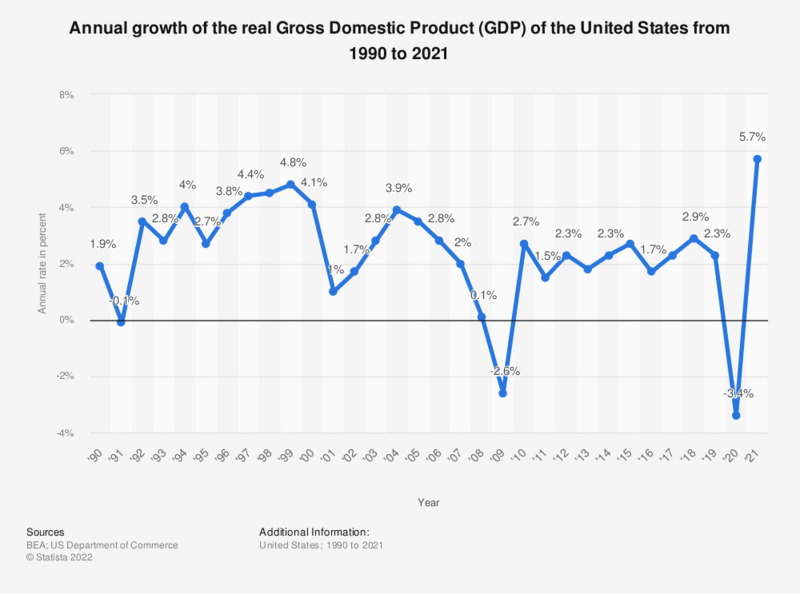 This graph shows the Real GDP growth rate of the United States from 1990 to 2018. Gross domestic product (GDP) refers to the market value of all final goods and services produced within a country in a given period. The Real GDP growth is adjusted for price changes, as inflation or deflation and is chained to the U.S. dollar value of 2009. The Real GDP increased by 2.9 percent in 2018. According to the BEA, the deceleration in real GDP in 2011 primarily reflected downturns in private inventory investment and in federal government spending and a deceleration in exports that were partly offset by a deceleration in imports and an acceleration in nonresidential fixed investment. The annual GDP in current U.S. dollars can be found here. A projection of the annual inflation rate of the country can be accessed here. Also, see the US GDP for further information. The monthly inflation rate for the country can also be accessed here. The Gross Domestic Product is the market value of all goods and services produced by labor and property within a country, regardless of nationality, in a given period of time. Normally, the GDP is calculated on an annual basis and includes all private and public consumption, investments, government expenditure and net exports. The Gross Domestic Product is one of the main indicators in measuring a country’s standard of living. The real GDP, as shown in the above statistic, is composed to compensate for changes in the value of the national currency, defined as inflation or deflation, which allows for the comparison of a country’s annual GDP over a longer period of time (i.e. several years or decades). In order to achieve this, the market value of all elements of the GDP for all shown years is chained to a preselected dollar value. In case of the U.S. real GDP, the data are chained to the 2005 U.S. dollar value to correct for inflation. The United States has by far the largest Gross Domestic Product of any single country on the globe. Only the European Union, with the combined GDP of its 27 member states, can top the U.S. GDP, and though China’s economy has grown rapidly to become the second-largest economy by GDP, China produces only half the market value of goods and services that the United States produces.